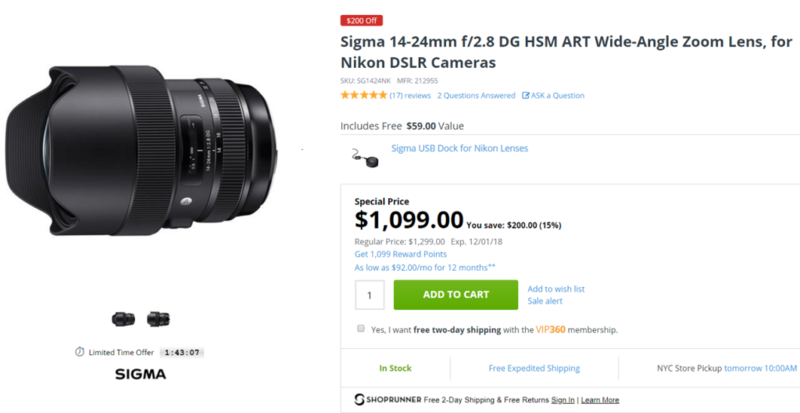 Deal of the day: The Sigma 14-24mm f/2.8 DG HSM Art Lens for Nikon F mount is currently $200 off at Adorama with a free USB Dock. For comparison, the Nikon AF-S NIKKOR 14-24mm f/2.8G ED Lens is currently $200 off at Amazon, B&H, Adorama for $1,696.95. The US Price of Sigma 14-24mm f/2.8 DG HSM Art Lens: $1,299, Pre-order Now!